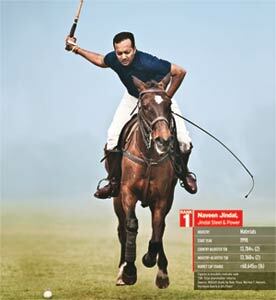 Naveen Jindal's mother, Savitri, keeps telling him to be serious and pay more attention to his work. He heads Jindal Steel and Power Limited, part of the business group founded by her husband Om Prakash, who died in a helicopter crash seven years ago. Executives of the group remain close to the matriarch, who is ranked among the richest in the country and knows many things happening in the companies. She should calm down now. Jindal, 41, has topped the list of the country's best chief executives over the last decade and a half in a study by Business Today, INSEAD Business School and Harvard Business Review. In the last five financial years alone, as global economic fortunes have swung violently, JSPL's revenue has trebled, its average return on net worth has been about 25 per cent, and its operating profit margin has been a very healthy 37 to 40 per cent. Yet, the mother's concerns are far from unfounded. Naveen, the youngest of her four sons, was never the brightest business star in the family. That epithet was reserved for the oldest brother, Sajjan, who runs JSW, the country's largest private sector steel maker. In fact, Naveen is not even your usual CEO. If you were to draw an image of a highperforming CEO, what would it be like? An alpha male? A workaholic? Someone with a work-life balance skewed in favour of the former? Someone who would have balance sheets for breakfast, drink endless cups of black coffee through the day and schmooze with investors at dinner? An aficionado of the networkers' game, golf? Naveen is none of these. And he plays polo. It was no surprise, then, that one of the other CEOs in this ranking, when he discovered the name of the top dog, mumbled: "Naveen... he is a good friend... but.... hem... haw...."
This other CEO ticks all the boxes in the previous paragraph. No surprise, again, that all the stock questions for an article of this type, fired over four foggy hours on a Sunday morning at a farmhouse just of f the Noida-Greater Noida Expressway, which includes a polo ground, a section where horses are kept, and a shooting range, fell flat. How does he engage with his investors? "I have hardly engaged with any of the investors. Our senior people, other directors do." Is he obsessed with his share price movements? "I hardly watch my share price. Sometimes I see it." "I do not have targets to be number one or number two. I am not very ambitious in that sense." How does he balance all the things in his life? "Sometimes by not doing a very good job (chuckle)." He says all this with a youthful, candid charm. And you want to believe him. Until what he has done with his company hits you in the face. Naveen's father, who never went beyond high school, rose from selling steel pipes in Hisar, Haryana, to set up the eponymous steel-to-power group. In an unusual move for family businesses, he took care to divide the group among his sons in 1998, when he was still very active. But it was not an abrupt division. When Naveen came back after completing his MBA from the University of Texas, in 1992, the father put him in charge of the group's ailing Raigarh plant in Chhattisgarh. It was an experiment that paid off. The factory suffered from many problems related to production and raw material. Naveen managed to persuade his father to invest in new technology and equipment. He bought access to raw materials such as coal and iron ore at a time when his competitors were focusing on expanding manufacturing capacities. Ever since, he has retained this focus on raw material. JSPL, which the Raigarh plant grew into, has coal and iron ore mines in east India, which feed its steel and power plants in Chhattisgarh and Jharkhand. It has rights to five more coal blocks, with reserves of 2.2 billion tonnes - the largest allotment to any private company in the country. In 2007, the company outbid ArcelorMittal for the development rights to iron ore mines in Bolivia that have reserves of 20 billion tonnes. This focus on raw material has helped JSPL become one of the lowest cost producers of steel in the country. "Being in a commoditised industry, you cannot outperform the industry without resources. Naveen has done what Lakshmi Mittal did elsewhere in the world," says Rishi Sahai, Managing Director of Cogence Advisors, a New Delhi-based boutique investment bank. Sajjan Jindal did not do this and is now paying the price. His JSW depends mostly on ore bought from the market and the ban on iron ore mining in Karnataka has hobbled the company. The stock market has responded to Naveen with fervour. JSPL, with just three million tonnes a year of steel making capacity, had a market capitalisation of Rs 47,000 crore on January 13. JSW, which makes four times as much steel as JSPL, had just Rs 14,229 crore in market cap. Even Tata Steel, about as big as JSW in domestic capacity and suffering none of its ore problems, was behind JSPL at Rs 39,874 crore. Investors seem to like the fact that JSPL is mainly into long products like rails and beams, which are used in construction, and will remain in demand in a country building - however reluctantly - infrastructure. Secondly, that first Raigarh lesson is never forgotten and there is constant search for new ways to do things. For instance, JSPL makes steel using sponge iron, which allows it to use cheap noncoking coal instead of the much costlier imported coking coal. But there is more to the high market cap than steel; there is also power, an area Naveen entered in 2007, with the commissioning of the first unit of his 1,000-MW plant at Raigarh, the first mega power project in the private sector. He failed to sign a power purchase agreement with any state electricity board, but succour came in the form of the government allowing private companies to sell power in the spot market. As the first major merchant power producer, JSPL capitalised on the opportunity. JSPL is not the only occupation Om Prakash bequeathed to his youngest son. Naveen is also his political heir. Om Prakash was perhaps the country's first true businessmanpolitician, who served as a minister in Haryana. Naveen is serving his second term as a member of the Lok Sabha from Kurukshetra. In fact, this is the legacy that Naveen has now embraced more than the other. There are two district headquarters in his constituency and he has houses and offices in both. He visits the constituency at least two to three times every month, spending five to six days there. People from Kurukshetra come to Delhi to meet him. Many even have his mobile number. They text him or leave messages and he calls them back. He says to build trust it is very important that they should be able to reach him. But all this takes time, doesn't it? Some who have worked with him in the past say they could do with a little more time spent with him on critical decisions. Is he a hands-off CEO? "Some people, whom I trust a lot, I let them do things. But nowhere am I a spectator. I like to play. You have to be hands-on, otherwise sometimes you can be badly let down." How does he divide his time? "Sixty per cent goes towards my duties as an MP and 20 to 25 per cent in business. Rest, I love my sports. That is also time-taking," he says. So how does he feel when he sees that his standing as a politician does not protect his business interests? His power plant in Chhattisgarh, which was to go on stream in March this year, has been delayed by a year and a half because former environment minister Jairam Ramesh sat on the clearances. "What did they achieve? Did they change the project by even one per cent? No. These things are meaningless. Some people just talk, some do things. The doers in every field have to be respected." Does he still say hello to Ramesh when they meet in Parliament? "I say hello to everybody. I say hello to him." Is he glad Ramesh is no longer the environment minister? "It does not matter. He only cleared our project, after the delay. Earlier, he was the one who got the order placed when he was the power minister. The same project he stopped [as the environment minister]."